Habitat III — held October 17-20, 2016, in Quito, Ecuador — achieved its goal with the adoption of the New Urban Agenda by acclamation. Consensus among 193 countries on a recommended path forward for global urbanization is no small achievement. The Global Planners Network and its allies were among the many private organizations reviewing and recommending the final language. Among the most important aspects are citizen participation, planning and development based on sound metrics, and transparency in governance. The first day of the conference included a Global Planners Network panel featuring Presidents Carol Rhea, APA; Phil Williams, RTPI; and Eleanor Mohammed, CIP; and Tim Van Epp, chair of APA’s International Division speaking on public participation. The capacity audience — more than 125 people — heard general ideas as well as specific cases from the speakers. GPN members and allies presented over 35 sessions at Habitat III ranging from climate change and disaster mitigation to urban design and cultural conservation. At the GPN booth at Habitat III: Shawn Kelly, ASLA; Carol Rhea, APA; Trudi Elliott, RTPI; Tim van Epp, APA; and Jim Drinan, APA. Photo by Jeff Soule. GPN’s exhibit space was shared with a broad, effective coalition including domestic allies, the American Society of Landscape Architects (ASLA) and the American Institute of Architects (AIA) along with international partners the International Federation of Housing and Planning (IFHP), the International Council on Monuments and Sites (ICOMOS), the Grand Circle Alliance, Paris, and the International Society of City and Regional Planners (ISOCARP). Each organization took turns staffing the booth and answering many questions. 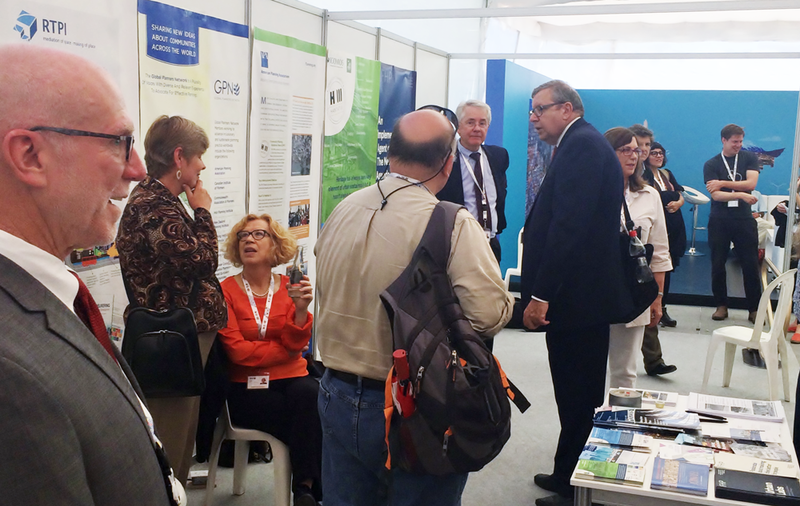 The exhibit area was open to both Habitat III attendees and local Quito citizens. Traffic was varied but steady and at times very busy. While there is nothing binding about the agreement, the fact that not only the national governments support it but also the unprecedented participation and concrete contribution of more than 1,500 non-governmental organizations suggests it will be an important tool as cities grow and develop. Over the next several months GPN will work with our allies to discuss how each member will develop guidelines for implementation to share among our members. Many of the New Urban Agenda recommendations are policies and practices that we already support. In addition, there are many examples, policies and planning cases from other countries that can inform our domestic practice, just as we share our best practices abroad. The first post Habitat Meeting on the action plan will be held in New York in mid-January.